Marshall Ryan Maresca has been a busy author keeping up with two series set in his world of Maradaine. Although I’ve enjoyed both, I have to give a slight edge to the Maradaine Constabulary novels because I’ve always been a sucker for stories starring lady detectives! 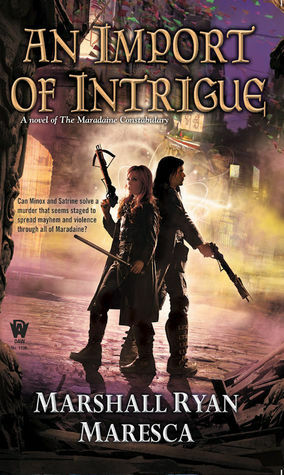 “Mixing high fantasy and mystery, this is Marshall Ryan Maresca’s second novel in the Maradaine Constabulary series, companion to DAW’s Maradaine Novels. Ooh nice! I saw this one not too long ago! Sounds intriguing! Oh yes curious about this one! Love the cover. Hope you love it! Sounds like an interesting series. I’ll have to look into them a bit more as this is the first time I’ve heard about them. Love the name Satrine…. I want this just because of the cover – I am that fickle. I haven’t of course read the first. *head desk* Yeah, always behind! I really am going to have to curb starting new series – otherwise I’m going to have no chance of ever catching up. Thanks for highlighting the series. I’ve never heard of it, but now I definitely have to check it out! I’m a sucker for lady detectives too. This one looks interesting. I’ll have to keep an eye out for it.